Where Rainbows End......Little Girls' Dreams Begin. All little girls love to play dress up and feel like a fairy tale princess. Let me design a dress perfect for her special occasion or choose from my custom collection. 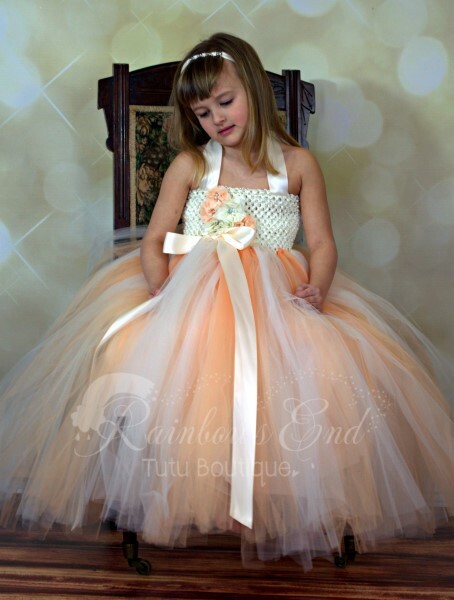 The Vintage Dreams tutu dress will transport your little girl to a different time and place. 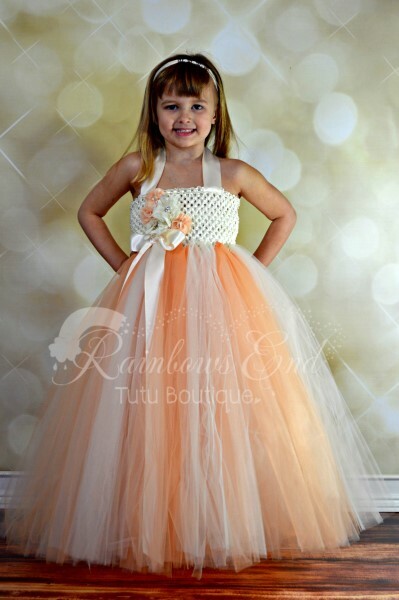 It is a perfect flower girl dress for any romantic wedding theme. A collection ranunculus and chiffon flowers with outstanding rhinestone and pearl centers, adorn the bodice of this peach and ivory gown. The skirt is extremely full and not see through. That said, it is made of strips of tulle, not solid pieces. Tulle can separate and bunch naturally with movement. I do suggest you wear a slip underneath. Each dress is handmade in my home studio. There may be slight variations based on availability of rhinestone brooches, flowers, etc. All materials are of the highest quality in every dress that I create. Design times are generally 3-4 weeks and may be extended to 8-10 weeks during peak seasons. Please order early and refer to our current shipping times in the left hand Information Menu.